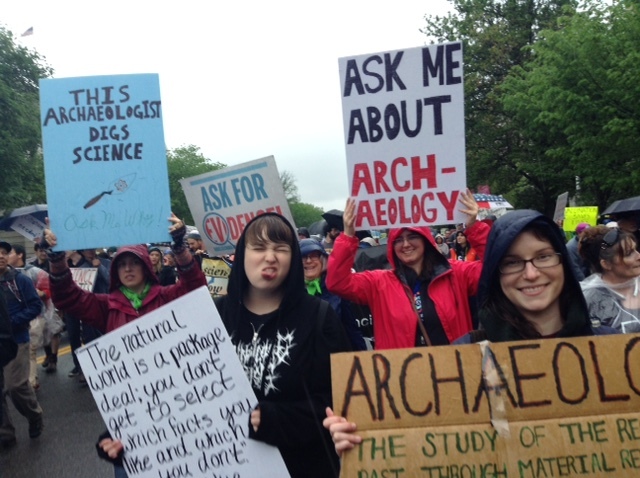 Last Saturday, Earth Day, Dr. Sarah, Danielle, Kate, Jared, Heather, Sami and I woke up in the early morning hours to hit the road for the March for Science in Washington DC. 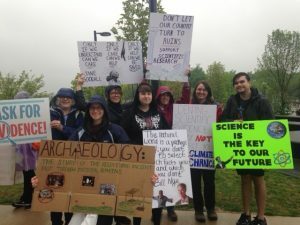 The weather forecast was calling for rain all day, so we came mostly prepared for that, with our signs of support in tow. 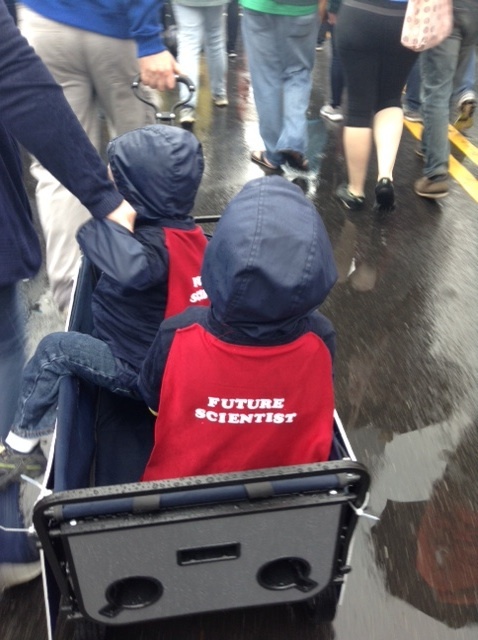 We arrived at the Metro Station around 9 am, still feeling groggy from our early start, but energized to join the thousands of people coming to the march for science. After a short Metro ride, we were heading toward the National Monument where we stood in line looking on at the beautiful new National Museum of African American History and Culture . We were surrounded signs that read “Science not Silence” and people in lab coats. Waiting in line to get into the rally, the rain began with a light drizzle. Inside the gates we made our way through the crowds to stand in front of a giant jumbo-tron to watch the many speeches that were planned for the day. Different scientists or supporters of science, young and old came to speak about the importance of science, and how it has impacted their lives and the lives of others. Sadly, no archaeologists spoke, but it was inspirational nonetheless. And finally….BILL NYE THE SCIENCE GUY came out to end the rally. The rain began to pick up, but the moment we had all been waiting for had finally come! He stood at the podium speaking about the need to encourage lawmakers to take the sciences seriously for the well being of all. 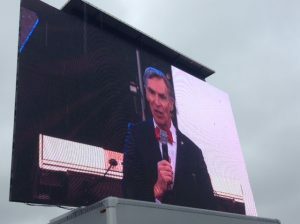 As a kid I idolized Bill Nye, and now that I’ve grown up I still see the same passion that came through my television set, and it makes me feel a glimmer of hope for the future of science and our planet, because as many signs around us said, “THERE IS NO PLANET B”. With time to kill, we stopped and got some lunch at a little deli where we had a chance to “dry” off a bit. With our stomachs full, we headed toward the front of the march. 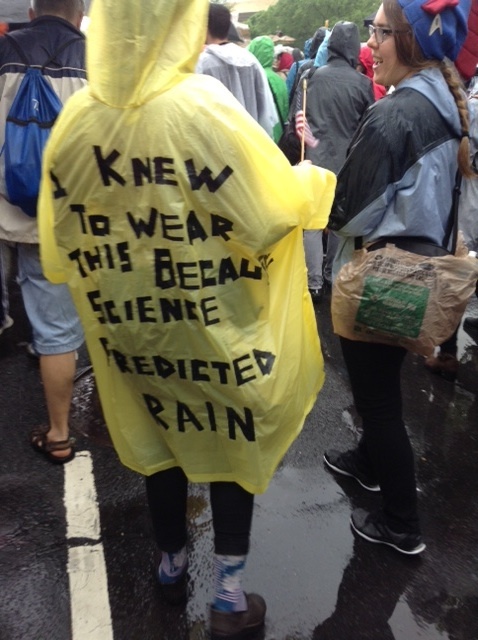 Waiting on the side of the road we watched as Bill Nye and a long line of smiling faces proudly held a “March for Science” banner. 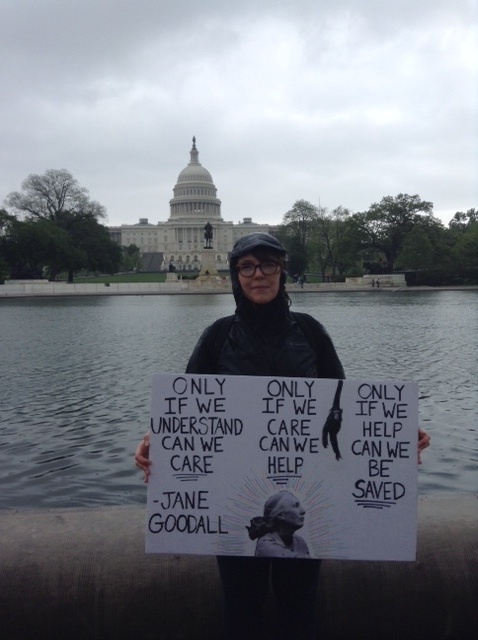 We joined the masses of people, holding our own signs high. We heard the occasional call and response chant of, “WHAT DO WE WANT? EVIDENCE BASED SCIENCE. WHEN DO WE WANT IT? AFTER PEER REVIEW!”. There was an overall feeling of connectedness, and it was an awesome feeling. The march ended at Union Square across from the Capitol Building where everyone dispersed to go back to their normal lives. A week later I am sitting at my computer thinking how lucky I am to be able to stand up for what I believe in. Archaeology may not be the first thing people think of when they think of science, but we are scientists through and through. With the treat to cultural resources in this country, we must work to preserve and protect them, because they are non-renewable resources, just like our precious planet. Although last Saturday was a long day after being up early and getting soaked, it was completely worth it in the name of science! This entry was posted in Grad School, International, Musings, Uncategorized. ← American Grad Students in Canada: Our trip to the SAA, eh.